The Formula Drift 2010 Round 3 event from Wall Speedway in New Jersey is in the books, and it proved to be yet another memorable weekend in the North East. Wall Speedway is a short-track oval course, with a very challenging bank to the first 180 degree corner. Get it right, and you can be a hero. Get it wrong, and you’ll be another victim searching the parts bin for a spare bumper or suspension piece. 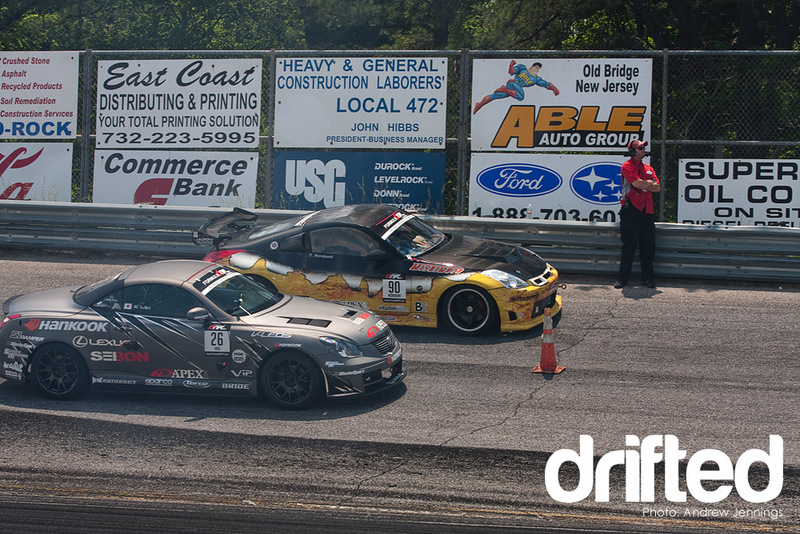 Unlike Road Atlanta, there is very little margin for error. Follow with me after the jump and I’ll examine what makes this little stretch of tarmac special before we get on to the main event. 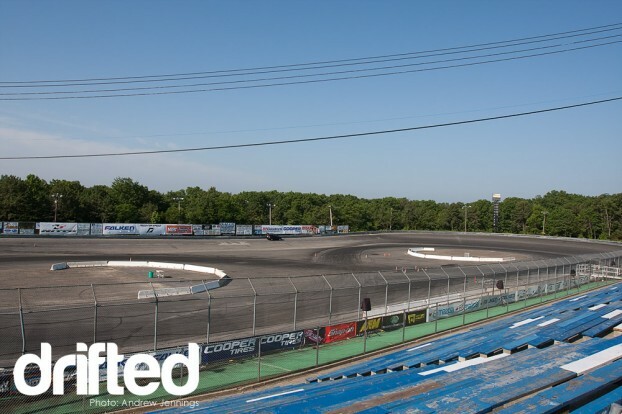 The track is located about an hour away from the big apple, and is actually named for the small township within which it lies: Wall Township. As you can see in the above photo, the entire venue is visible from anywhere in the small grandstands. The paddock lies just to the left of the course, making it easy for crews and fans alike to get close to the cars before the action heats up. 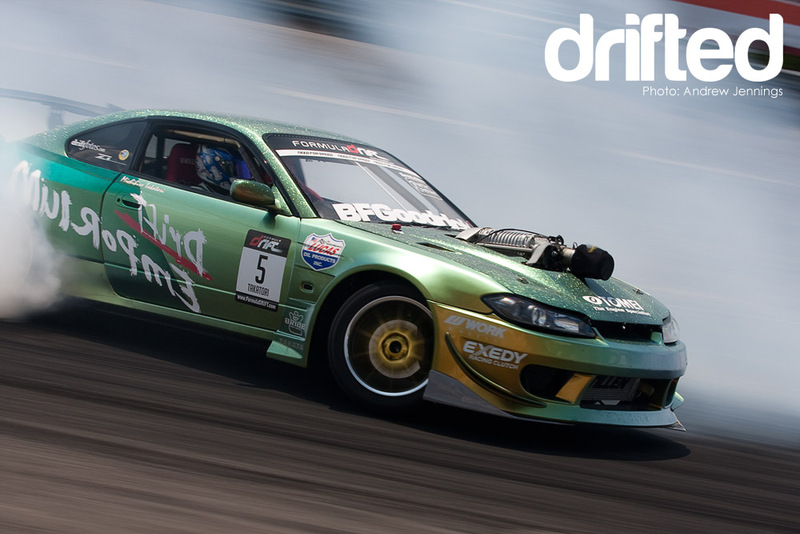 Drifting in the U.S. features a wide variety of teams. Some, like Falken tires, can afford a large pit area complete with a hospitality tent. Others are more humble. 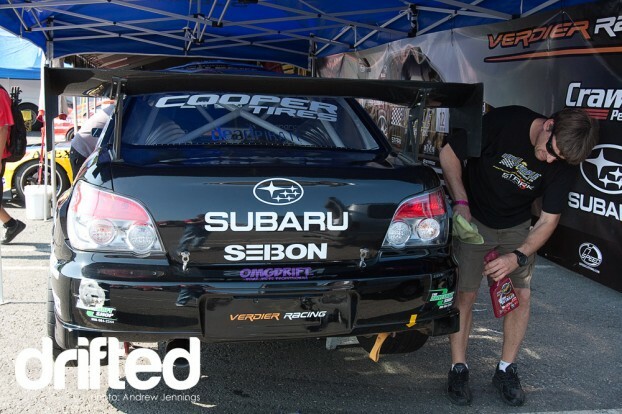 Below, driver and team owner Stephan Verdier gives his car a quick detailing before the day begins. And then, there are the true privateers. Yes, that is a Honda Element (originally a FWD car). 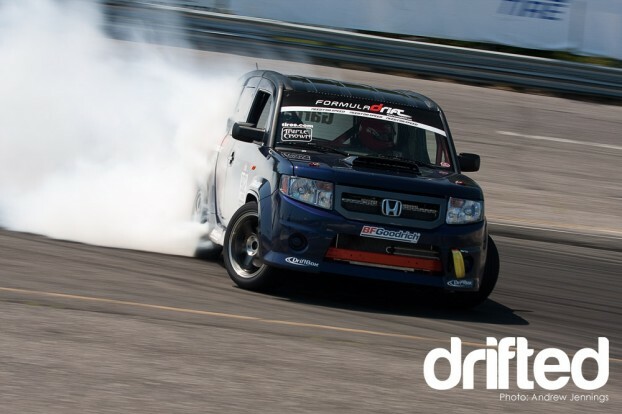 James Robinson, a part of Team Honda Research, is redefining what you thought a drift car could be. 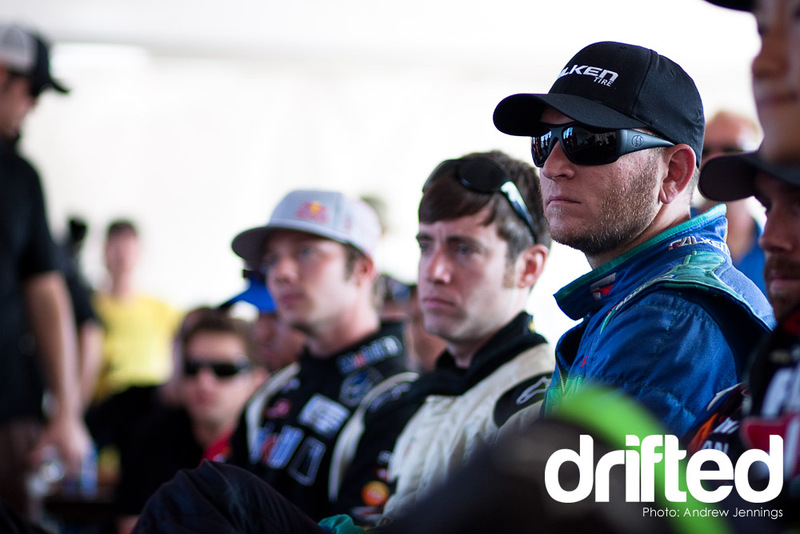 The RWD box-on-wheels can light ’em up, but he still has a ways to go before he will be challenging for a podium. On the inside, things are all business. I love the way that James has fitted that gigantic e-brake extension. 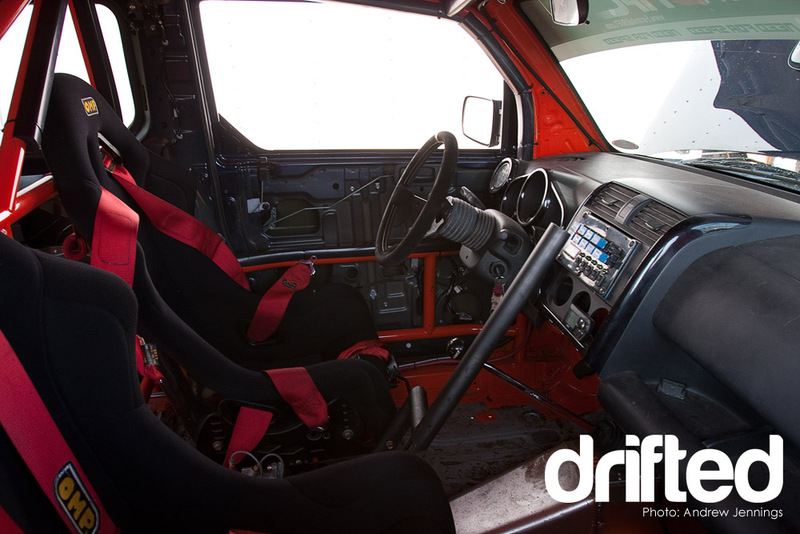 His seating position is more upright than a sports coupe, and this e-brake position allows his hand to yank back on it more easily than if it were down by the shifter. Don’t believe me? Check out his sideways action below. But I digress. Back to the track itself. Before the drivers are allowed out on course, the judges hold a meeting to go over the proper line, speed, and other formalities. Above, Justin Pawlak of Falken tires looks on among his Drift Alliance pals. 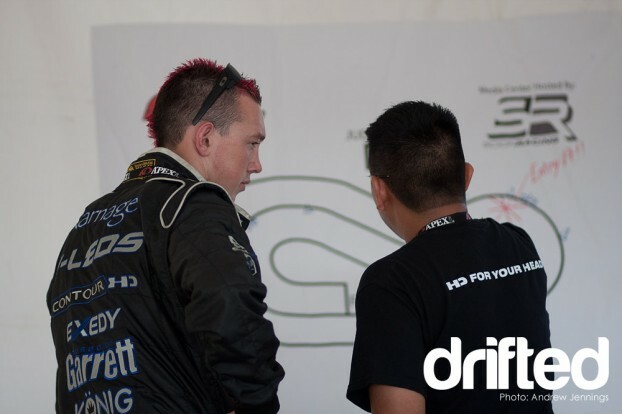 And below, Dean Kearney and his Intec Racing team manager Lawrence go over the layout after the meeting. The track starts out simple enough, with a long straight that turns right across the banking. Then, drivers transition off the banking and hook a quick left, before initiating another right for their second 180-degree drift around the flat land below the opposite bank. They follow that line through the center of the track picking up as much speed as they can, and cap the run off with a wide left around the final 180. It may sound dizzying (it can be for a photographer in the middle of all that spaghetti!) but it allows for some great close-contact action. The start line of the course also happens to be on the banking. Trying to rocket away from a standing start on an off-camber hill is not easy. Drivers must control their traction so that the back end doesn’t slide down and away from them. Otherwise, they’ll go into that long first corner too slow, and wobble around looking for the right angle. 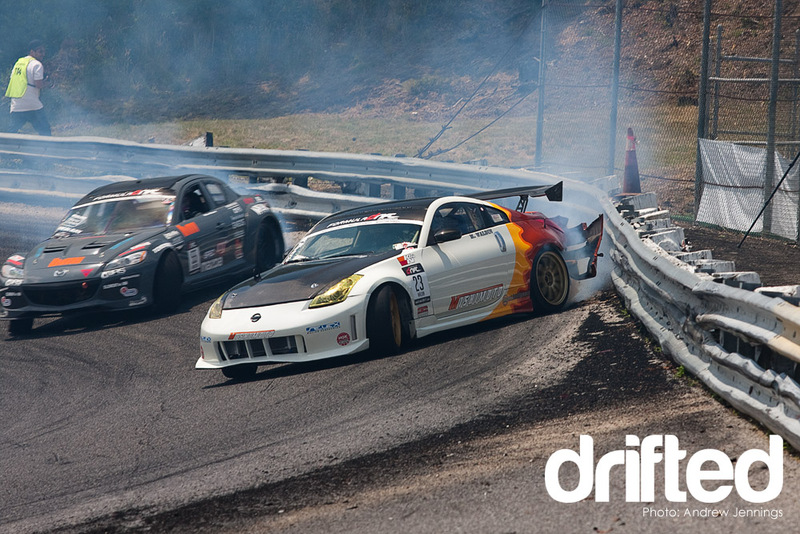 Matt Waldin, would you care to demonstrate this for us with your 350Z? Whoops, looks like he got too hot on that run, clipping the guard rail just enough on his rear quarter to dislodge the bumper. Oh well, those are ‘optional’ anyway. Hometown favorite Chris Forsberg knows this track well, and put on some great runs during the early practice sessions. Here he exits that second 180, a great spot to put up a huge smoke screen on anyone who dares to follow behind. Did Chris have what it takes to stand atop the podium in New Jersey? Stay tuned for more from the event to find out!